Restore-A-Deck Cleaner and Brightener system is a powerful “eco-friendly” two-part restoration system. 100% Biodegradable Concentrated powder formula. Prep wood surfaces for re-coating with a wood or deck stain and restores weathered gray wood to natural color. Note: We tested Gemini’s Restore-A-Deck Kit on a heavily gray and dirty fence that was neglected for 8 years. – Gemini’s Restore-A-Deck Kit worked very efficiently to remove the graying from the fence. Even though the fence was severely neglected, the cleaner and brightener restored the wood to 90% of its original look. – Excellent! Gemini’s Restore-A-Deck Kit is a powdered concentrate that is hard to beat when it comes to cost. The kit can clean and brighten up to 1000 sq. feet. You would need 3-5 times as much if purchasing a liquid packaged cleaner or brightener. – Gemini’s Restore-A-Deck Kit cleans and brightens wood. Not designed to remove stains or finishes. – We emptied the entire Step 1 Wood Cleaner into a 5-gallon pail of water. We stirred to dissolve and applied the cleaner with a garden pump sprayer. The Gemini’s Restore-A-Deck Step 1 Wood Cleaner needs about 5-10 minutes to activate. We stiff scrub brushed the surface, rinsed and then applied the Step 2 Brightener. No need to scrub the brightener, just rinse after a few minutes. – The pine fence looked almost brand new when the wood dried! – Gemini’s Restore-A-Deck Kit is an excellent product to restore weathered wood or for prepping a stain for reapplication. Hard to beat the cost and ease of use. Is this Gemini Kit the Same product as the Restore a Deck Cleaner Stripper that appears to be in bags on some web sites? The Gemini contains a cleaner and brightener. It is not a stripper. Try the Flood Solid Stains. Got news that the Gemini cleaner/brightener shows up today. Cloudy and rain forecasted for NE PA,,I can still use both products in the rain? Also, I have approx 100 verical 2×2 rails that I’ll be cleaning and brightening as well. Any suggestion on how to apply the product to these narrow strips.? Could I use a 2”foam brush instead of spraying ( I couldnt imagine how much “overspray” I would waste by spraying )?? Thanks in advance folks…again, fabulous website !!! Light rain but not heavy rain. Pump spray on the spindles and then pressure rinse off. Someone else ased this question and didn’t get a positive response, so I am asking again (given there is quite a price difference). As researchers, I would think you would want to know, too. What is the difference between Restore a deck and Gemini Restore a deck? Sounds like the same product with different labels. Did you intend to give give 2 reviews rating 1 and 2 for the same product? Doesn’t seem, well, thought out? Unless you can clarify what the actual difference is. Are the ingredients the same? The same ratio of mix? From the same manufacturer? I belive the Gemini is private labeled but you would have to ask them directly. Thi may not be the forum for this, but I’ve been having a difficult time finding an answer – I am currently stripping a painted hardwood (pine) in my home. The home is 175 years old and the pine is just not returning to a more natural state; its quite dark – can I use a brightener indoors on this type of floor? I have a rough cut cedar fence that’s about 5 years old. I had previously treated it with a clear coat. I’m planning to stain it now with a semi transparent TWP and have pressure washed it. From reading your site it sounds like I still need to clean and brighten the wood before staining. Is that correct? Strip and brighten to remove the clear coat. Can the brightner be applied via the same method as the deck cleaner by garden spray pump bottle? Yes you can use a garden pump sprayer. 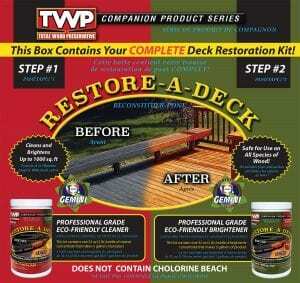 We are about to use TWP 100 stain on our deck which is pressure treated pine and about 10 months old. The wood has grayed and has some mold, etc.. Should we use the cleaner and brightener before applying the TWP 100? I have not treated my deck in the last 2 years. Some areas are weathered and the protected areas are still sealed. I have never used a stain stripper on it. I built the deck in 1998. The wood is still in great shape for the age. Should I use a stain stripper at this point, and if I do, do I still need to use a cleaner afterwords. Or, Will a deck cleaner take care of the weathered areas so I can avoid using a stripper. The last 2 times I used Benjamin Moore semi-transparent. The last time did not hold up at all with their new formula. If you still have some of the BM on the deck then you will need to strip it off and brighten the wood when done. No need to clean if you use a stripper. Will Gemini restore a deck remove possible mill glaze on a pressure treated pine deck 10 months old and never stained? If I don't have a pressure washer, can I still use safely and effectively use this product? Jack, you can scrub well I suppose and rinse when done. We have TWP Stain on our porch oak deck. This is the first full year of its application. Now after the winter is over, there is a bit of dirt/grime and salt stains and what have you. I am not ready to restain, maybe another couple of months, but the wife want to clean the deck. So will using the Gemini Cleaning work for this, or should it be used just before I am ready to restain.? Or should we just use another cleaning solution of some kind for this seasonal cleaning job? Bill, I would not use this Gemini Kit until you are ready to apply a maintenance coat of TWP. Have you tried some soapy dish water with a soft push broom? Cedar siding project. When using a stripper do you start at the top of the wall and go down or the bottom and go up? Do you strip the entire wall and then use the cleaner? Carl, top to bottom. No need for a cleaner if you use a stripper. Use a wood brightener when done with the stripper. Hi, Will this work on a solid color stain? Jim, it will clean off dirt and mold but nothing effectively removes a solid color stain. is there a difference between gemini restore-a-deck and restore-a-deck?? Not sure but I think they might private label.